Joy Creek Photo Archive (c) all rights reserved Evergreen. 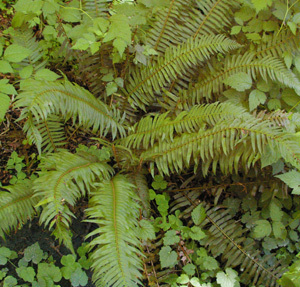 Polystichum munitum is ubiquitous in our Pacific Northwest woods, yet always useful and forgiving even of dry shade. Long 3- to 4-foot lance shaped fronds with linear segments.A Great Plant Picks selection.